Sorry for the absence of posts. There were a few distractions these past couple weeks but we are back! It's technically not summer anymore and this recipe might be too late for some of you living up north..but we decided to share anyway. In Korea when it is really hot and muggy in the summer your appetite goes away and it's hard to think about eating anything. 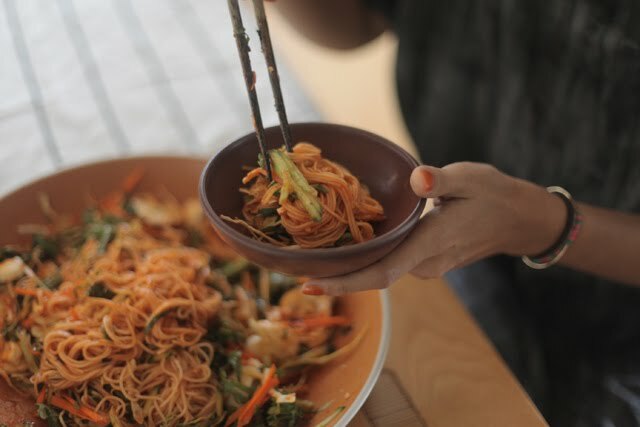 That's when we eat a dish like this. It's cold, sweet and spicy and will bring you and your taste buds back to life on a hot afternoon. 1. Mix all the sauce ingredients and set aside. 2. 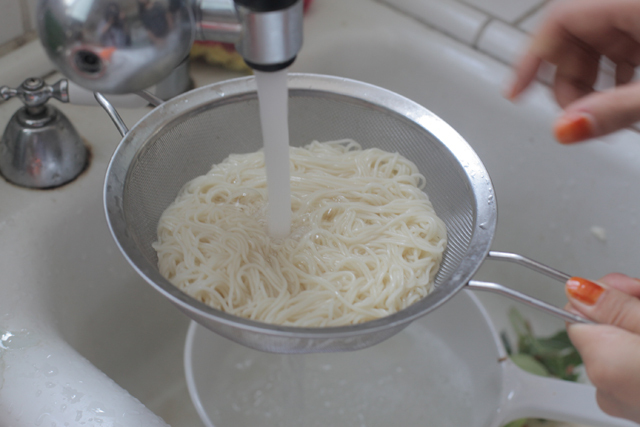 Add the noodles to a pot of boiling water. When it comes back to a boil add one cup of cold water. 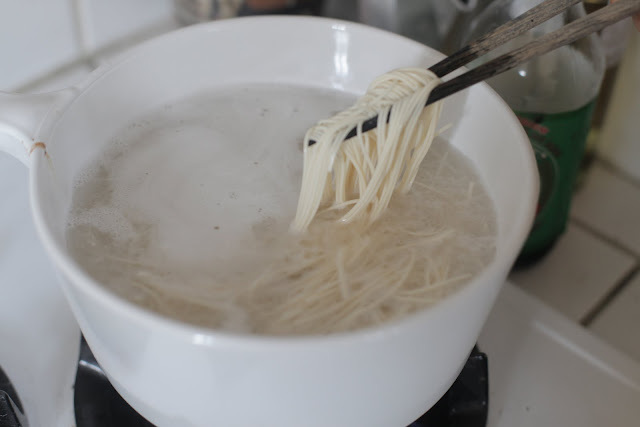 When it comes back to boil again the noodles should be done. 3. Rinse with cold water and drain. 5. 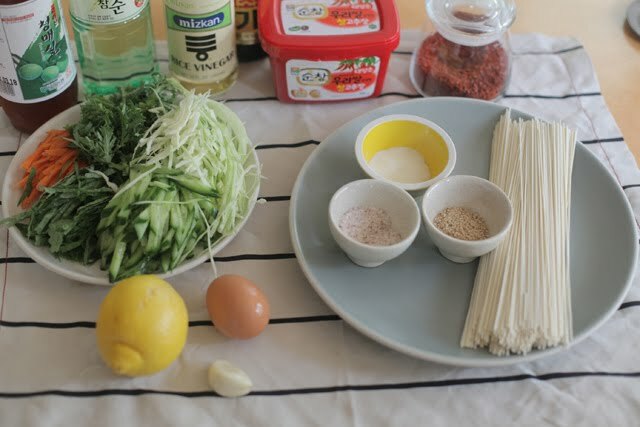 Add the sesame oil and mix everything together with chopsticks. 6. Serve into individual bowls. It was a pretty big platter of noodles, but apparently not big enough. Went really well with the leftover rose wine that Jeana had. you've just prepared one of my favorites. 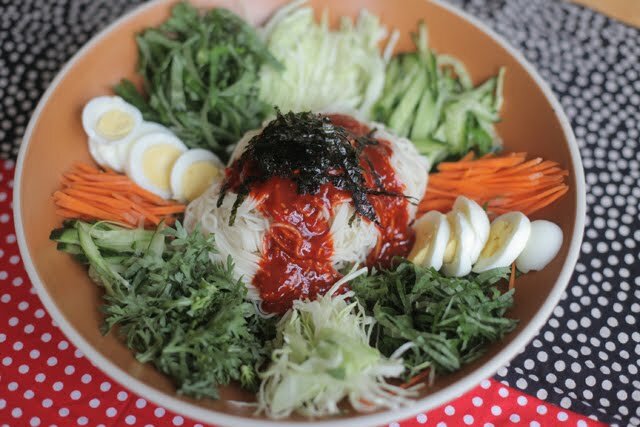 yet, i have realized that i can't have a favorite korean meal. they are all just so delicious. Curious what that middle bottle is in the first photo? Looks like "cham soon"? Is that another ingredient? Thanks! This looks yummy. @Anonymous We thought we were going to use rice wine but ended up not using it. 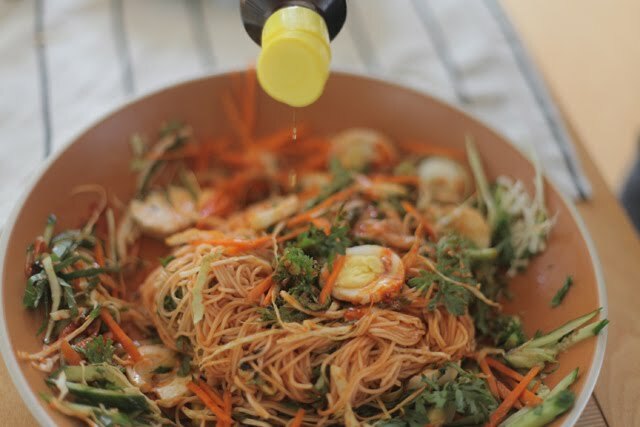 You can try adding a spoon to the sauce and see if it adds more flavor..
Oohhh, this looks super good, Do you think this would work with rice instead of the noodles? Ah, this looks so good, so beautifully photographed. I'll have to make this TODAY! How come I've never had this?! What is mugwort in Korean? Is it the greens in the top of the bowl (12 o'clock position) in the first picture? @ruthie@thetwicebitten I think it would be delicious with rice. Yes, you can find it in Korean grocery stores. It's very fragrant and adds a certain Korean rustic flavor. But you can substitute with other veggies. YUM! I will be making this asap. Thank you for posting it with step by step pics. PS: I once had a chopped salad in a Korean restaurant in NJ. 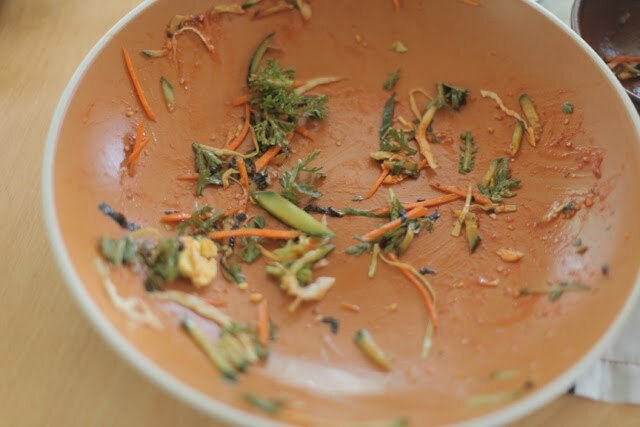 It was lots of stuff, finely chopped and tossed together served in a bowl. Alas, I do not remember the name. It had seafood. Would you by any chance know anything about this dish? If so, just a name would really help me out! Gorgeous blog! So happy to have stumbled upon it, don't have a lot of experience with Korean food but can't wait to try your recipes! Can I have some? It looks really good! love love love this blog! can't wait to make this. Yay! 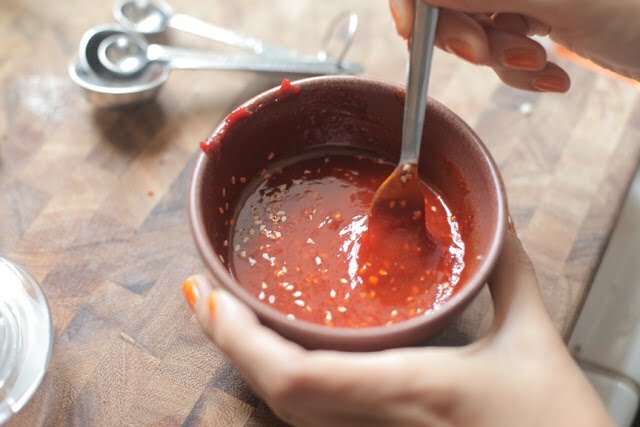 I eat something very similar at a Korean place a few months ago, and I've been meaning to find the recipe ever since.